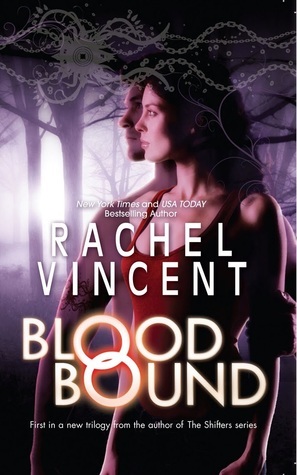 I was lucky enough to hear Rachel Vincent speak earlier this year at The Harlequin Blogger Summit. 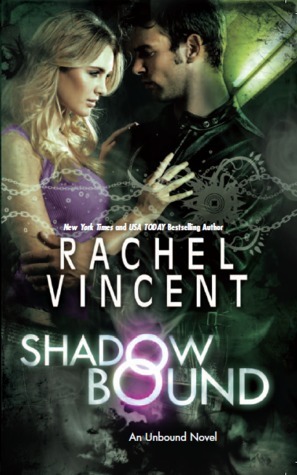 Having already enjoyed her Shifter’s series, I ordered Blood Bound and Shadow Bound to read in preparation for her visit. Though I didn’t have the time to review either novel I devoured them both and gave them each 41/2 stars. In general I prefer urban fantasy to paranormal romance but what I love about this series is how well it combines the two. Oath Bound, like the other installments in the Unbound trilogy, is gritty, dark, fast paced and action packed. The development of the romance is an important element but it doesn’t take precedence over the plot, which is complex and well thought out. Oath Bound is the final novel in the adult paranormal romance trilogy which is set in a world where the ‘skilled’ population are forced to choose sides between two ruthless mafia-like syndicates. Jake Tower and Ruben Cavazos exploit the abilities of ‘binders’ to press those they find useful into servitude to ensure the operation of their criminal and business enterprises. The complex and creative world building quickly drew me in, much of the groundwork is laid down Blood Bound and the framework remains an important part of the story through the trilogy. In Oath Bound the a major part of the plot involves the characters actively working to dismantle the Tower group. ris’s sister, Kori, a Shadow walker, was featured in Shadow Bound developing a relationship with Ian Holt. Kenley, their youngest sister and a gifted Binder, has been an integral cast member all the way through, and Oath Bound begins with her kidnapping. Sera is a newly introduced character, the unacknowledged, illegitimate daughter of Jake Tower, who proves to be a vital linchpin in the group’s plans to destroy the Tower Syndicate. Sera has made the mistake of approaching her Aunt Julia for help when Kris interrupts Sera’s meeting with Julia after Kenley is taken. In the firefight that follows, Kris takes Sera with him as he escapes into the shadows. Sera is incensed, certain she is being held hostage while Kris can’t properly explain his compulsion to take her. Various story arc’s span the trilogy so I would recommend starting at the beginning if you are interested. 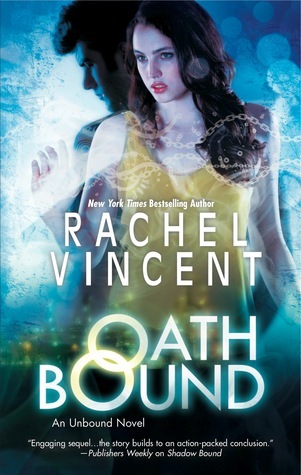 I have really enjoyed the Undone series and while Oath Bound provides closure, I’m sorry the author chose to end it. Still, Rachel assured me when I had the opportunity to ask, that a new adult audience series would be launched later this year and I am looking forward to it. 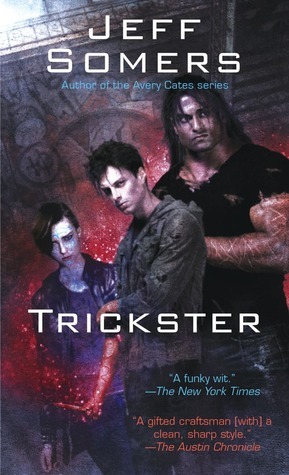 Trickster introduces a new dark and gritty urban fantasy series by Jeff Somers featuring Lem, a low level blood mage. A member of the Idimustari he scrapes by using his talent to fleece the ‘normals’ with a handful of illusions, refusing to enhance his power by using the blood of others. Somers’ world building is intricate and original. He takes his time establishing the boundaries of his lore and the limitations of magical system. There are just two rules of blood magic, the Rule of Perception and the Rule of Volume, which boils down to the more blood, the bigger the ‘trick’. While establishing the world takes some time, Trickster eventually launches into fast paced action as Lem and Mags try to stop Renar and Amir from using Claire to enact a spell that will decimate the world’s population. Lem is an anti-hero. Tricksters ‘are not good people’ as he so often asserts. Aside from using magic to rob ‘normals’, few have any qualms about bleeding them to supplement their spells. Though Lem is convinced he is no good, he cares for his ‘non-breeding life partner’ Mags – a low level, slow witted mage and Lem has always refused to use anyone else’s ‘gas’, causing a rift with his mentor and stunting his magical development despite an obvious talent with Words (spell making chants). And when Lem finds a young girl, Claire Mannice, bound and trapped in the trunk of a car of a high level mage he risks his own life to rescue her placing himself squarely in the path of the world’s most powerful Archmage, Mika Renar and her apprentice, Cal Amir. Trickster is seedy, bloody and exciting. Full of morally ambiguous characters in an intriguing and complex setting, I was thoroughly entertained and I am hoping the next installment is available sooner rather than later.